MWC: Invoxia AudiOffice is iPod Bluetooth speaker dock and office phone | What Hi-Fi? Invoxia has something a little different at Mobile World Congress, a speaker dock that doubles as an office phone. The AudioOffice promises high quality audio from the integrated speaker dock, the 3.5mm connection or via Bluetooth. 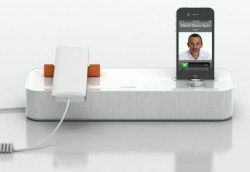 But it also incorporates a landline-style phone, which uses your iPhone's contacts or Skype connectivity to deliver superior sound for voice calls. Invoxia has its own In Vivo Acoustic technology to drive four wide-bandwidth speakers, while there are two digital microphones for picking up sound in your room during calls. Dock your iPhone to use apps such as Facetime and Skype, make voice calls or listen to your music. With a supplied add-on it also supports iPad docking while via Bluetooth you can connect any Android smartphone or other music player. The Invoxia AudiOffice is due on sale in March for 299 euros.